This polished stone axe-head was found at Mulbuie on the Black Isle. It dates from the Neolithic period (4000BC - 2401BC) a period during which farming was introduced and developed throughout the British Isles. People used such axes to cut down forests, as they cleared land for crops and livestock. Where suitable sources of hard stone were available, so-called ‘axe factories’ developed – places where the rock was quarried and chipped into ‘rough-outs’ ready to be ground and polished into finished axe-heads. In Scotland, there is a notable example of such a site near Killin in Perthshire. However, the Mulbuie axe-head is made from porcellanite, quarried at Rathlin Island, off the north east coast of Northern Ireland. It is a very hard stone, making it suitable for axe manufacture. Polished, it has a pleasant, almost porcelain-like sheen, adding to its attraction. The fact that this object has travelled from Rathlin to Mulbuie suggests patterns of trade, exchange and communication between people living and moving along the route connecting the two regions. We can almost guess the route the axe took as it passed from hand to hand: by sea from Antrim to western Scotland, then by land, river and loch along the Great Glen and, finally, across the Beauly Firth. The axe-head shows signs of having been used. It is also highly polished. Certainly, axes like this would have been regularly re-ground and sharpened. Accordingly, several are believed to be very much smaller than their original size. Researchers believe that a number of axeheads may have been used as items of wealth display and exchange. They could have been given as ‘expensive’ gifts to mark special occasions, such as the coming together of individuals and communities or maybe to ‘seal deals’ regarding land, livestock or territory. 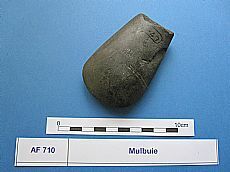 The Mulbuie axe-head might have been used for many purposes during its journey from Ireland to the Highlands. Perhaps, by the time it reached the Black Isle it had already become treasured heirloom; a tool revered for its usefulness in enabling communities to settle and grow food.